On Tuesday, Nov. 29, President-elect Donald Trump named Rep. Tom Price (R-GA), a former Emory University School of Medicine faculty member and Grady Memorial Hospital physician, as his pick for Health and Human Services secretary. The U.S. Department of Health and Human Services includes agencies such as the Centers for Medicare and Medicaid Services, the Food and Drug Administration, the National Institutes of Health, and the Atlanta-based Centers for Disease Control and Prevention. Price, who represents Georgia's 6th district (encompassing parts of Cobb, DeKalb and Fulton counties), was appointed chairman of the House Budget Committee at the end of 2014. 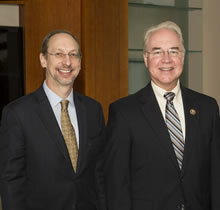 Price is well-known for his knowledge of health care issues. "Emory has been fortunate, over the years, to enjoy a close, collaborative working relationship with Tom Price," says Jonathan S. Lewin, MD, Emory executive vice president for health affairs, executive director, Woodruff Health Sciences Center, and CEO and Chairman of the Board, Emory Healthcare. "When I met with him this past summer, I was struck by both his intensity and inquisitiveness. He looks for solutions where others have been stymied." As HHS secretary, Price would have a key role in implementing the new administration's plans regarding the Affordable Care Act. His own plan is called the Empowering Patients First Act. Before his election to Congress in 2004, Price was an orthopedic surgeon. He grew up and went to medical school in Michigan, and came to Georgia for his orthopedic surgery residency at Emory. He entered private practice in 1984 and was one of the founders of Resurgens Orthopedics, becoming involved in politics through the Medical Association of Georgia. While he was a member of the State Senate, he became an assistant professor at Emory, starting in 2002. He was also medical director of the Orthopedic Clinic at Grady Memorial Hospital, overseeing the training of resident doctors. "I have known Tom Price for almost 20 years," says Michael M.E. Johns, MD, professor in the Schools of Medicine and Public Health, executive vice president for health affairs, emeritus, and CEO of Emory Healthcare, emeritus. "Of all the traits that will enable him to excel as Secretary of the U.S. Department of Health and Human Services, I especially appreciate his honesty. While we do not agree on everything, he is always willing to listen, learn and engage. He understands how health systems work; he recognizes the challenges facing our healthcare workforce; he knows the importance of biomedical research to the advancement of health and healing, and he genuinely wants to do what is best for patients." Price's wife Betty is also an Emory-trained physician; she is an anesthesiologist who completed her internship and residency at Emory. Betty Price currently serves in the Georgia State House of Representatives after winning a special election to her seat in 2015. Congressman Price has been a regular visitor on the Emory campus. In October, for example, he discussed the future role of Congress in health at an event at Emory's Goizueta Business School. While here in May, he expressed support for stronger federal funding of scientific and biomedical research, which has been backed by both Democrats and Republicans in the past. Price tied any major expansion of federal funding for scientific research to reform of programs such as Medicare and Social Security. He discussed how the federal budget is dominated by spending on these entitlements, as well as interest payments. He noted that interest payments on the national debt, at $230 billion per year, dwarf research budgets in all federal agencies combined – even at a time of low interest rates. Price also advocated streamlining the Food and Drug Administration's approval processes for new antibiotics and medical devices. He expressed concerns that the United States' role as a leader in medical innovation was waning, because of regulatory constraints that drive devices such as heart valves to be tested elsewhere first. Price has looked for ways to strengthen funding for Graduate Medical Education and has evaluated policy solutions that embrace patient-centered health care. Finally, he is supportive of providing physicians with more protection in court against malpractice lawsuits, noting the link to higher healthcare costs. "Emory is proud of its work with Chairman Price over his years in Congress on a variety of issues, including graduate medical education and the impact of research funding within the economy. He and his very capable staff have always had an open door policy," says Cameron Taylor, vice president of Emory's Office of Government and Community Affairs. "I am looking forward to assisting him in any way that the Woodruff Health Sciences Center can in his new role in service of our country," says Dr. Lewin.